WASHINGTON, D.C. -- Full-time U.S. employees are upbeat about using their computers and mobile devices to stay connected to the workplace outside of their normal working hours. Nearly eight in 10 (79%) workers view this as a somewhat or strongly positive development. These findings are from Gallup Daily tracking interviews, conducted March 24-April 8, 2014, with 3,865 U.S. workers employed full-time by an employer. While a strong majority of working Americans view the ability to work off-hours remotely in a positive light, far fewer say they regularly connect with work online after hours. Slightly more than one-third (36%) say they frequently do so, compared with 64% who say they occasionally, rarely, or never do. The relatively low percentage who check in frequently outside of working hours nearly matches the 33% of full-time workers who say their employer expects them to check email and stay in touch remotely after the business day ends. Among those who frequently check email away from work, 86% say it is a somewhat or strongly positive development to be able to do so. However, this is only slightly higher than the 75% of less frequent email checkers who view the technology change positively. Even among employees for whom staying connected is compulsory, 81% view this development it in a somewhat or strongly positive light. Frequent checking of messages outside of work hours is more common among men (40%) than women (31%). It is also slightly more prevalent among millennials (38%) and those in Generation X (37%), compared with baby boomers (33%). Employees with a college degree or higher are more than twice as likely to regularly check work email versus those with less than a college degree (48% vs. 23%), and the highest earners are about twice as likely as the lowest (53% vs. 25%) to say they do the same. The education and income differences could reflect the greater likelihood of Americans in high education and income groups to be employed in white-collar or professional occupations where email communication is likely a more crucial aspect of the job. The ubiquity of Web-enabled technology in U.S. workers' homes and lives could be a factor in their willingness to connect with employers outside of working hours. 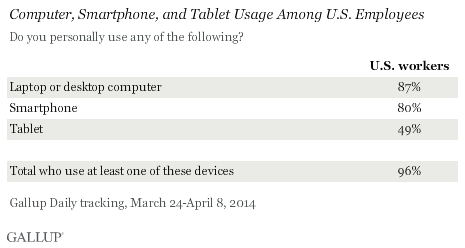 Gallup estimates 80% of full-time U.S. workers have a smartphone with Internet access, 87% have a laptop or desktop computer, and 49% have a tablet computer. In all, 96% of full-time American employees say they use at least one of these types of devices. When asked how much time in a typical seven-day week they spend working remotely using a computer or other electronic device, such as a smartphone or tablet, employees who report checking their email frequently say they spend nearly 10 hours working remotely. Those who occasionally, rarely, or never check job-related email outside of work report spending nearly four hours a week working remotely. Despite technology's tendency to blur the lines between employees' work hours and off-hours, most full-time workers in the U.S. take a positive view about using their devices to stay in touch with work after normal business hours. Nearly all workers say they have access to the Internet on at least one device, whether a smartphone, laptop, desktop, or tablet, so it may be that they enjoy the convenience of easily checking in from home instead of putting in late hours at the office. They may also appreciate the freedom this technology offers them to meet family needs, attend school events, or make appointments during the day, knowing they can monitor email while out of the office or log on later to catch up with work if needed. While about one-third of employees currently say they frequently check email after work, that a clear majority of workers feel positive about the ability to do so is encouraging for employers looking for more ways to integrate mobile devices into the way their companies work. Given that those who frequently check messages away from work also log twice as many hours remotely as those who occasionally, rarely, or never check email out of the office, enabling more employees to do so may play a role in increasing productivity. Read a related article at the Gallup Business Journal. Results for this Gallup poll are based on telephone interviews conducted March 24-April 8, 2014, on the Gallup Daily tracking survey, with a random sample of 3,865 full-time working adults, aged 18 and older, living in all 50 U.S. states and the District of Columbia. For results based on the total sample of national full-time working adults, the margin of sampling error is ±4 percentage points at the 95% confidence level.